The Divine Collection is exquisite sophistication, a true statement of the Platinum Collection by Quoizel. 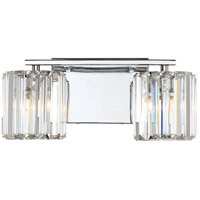 The simple backplate gleams in Polished Chrome and reflects every cut and sparkle of the crystal-glass. The refractive glass is arranged in slats pinned top and bottom to form a shade around the LED bulb.